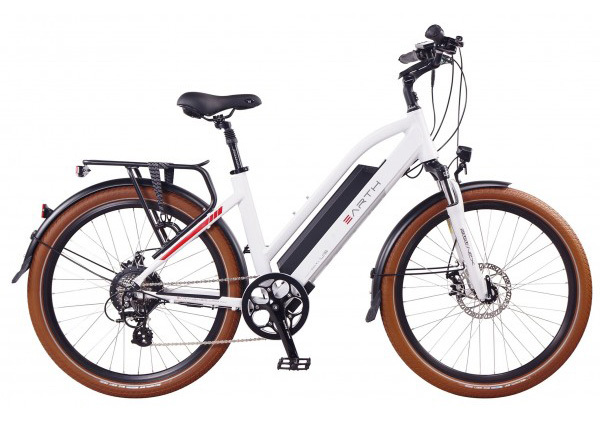 The EARTH PRIME Ui5 XT is a high performance street orientated ebike. It’s had numerous upgrades in the last few years and just keeps on getting better. They’re increased the battery capacity to allow an enormous riding range and made minor changes to seat and grips for enhanced comfort. Along with great running gear, disc brakes and integrated lighting system this is a fine ebike. It’s both throttle controlled and pedal activated. The New EARTH PRIME Ui5 features 26 inch wheels powered by new quieter hub motor and 48V 13Ah (624WH) lithium ion battery pack. It has quality Schwable Big Ben 2.15 tyres, SR Selle Royal Plush saddle and a Suntour suspension fork. It is one of the best value for money electric bikes out there.